There is something special about enjoying the latest blockbusters from the comfort of your home whilst surrounded by your creature comforts. 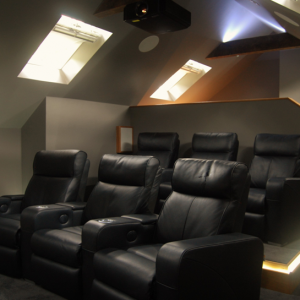 Here at Home Media, our friendly and professional home cinema installers in Kent will work tirelessly to design a bespoke home theatre to your dream specification, so you can enjoy a cinematic experience without leaving your house. We leave no stone unturned to guarantee that we make the most out of your budget. We pride our service on not only delivering the bespoke home entertainment system that you have always wanted whilst being as honest and helpful as we can along the way. Our friendly team are happy to make a site visit in order to scope out your potential system and work with you to visualise your home cinema dream. Whether you know what you want for your home theatre or need more direction, then don’t hesitate to give us a call on 01622 676703.